Tonight, my husband and I went to my company's Christmas party. Carol, one of my coworkers, is so very gracious and every year, without fail, she offers to host the party. And even though her house is large, by the time everyone arrives, there is standing room only. We all look forward to the Christmas party because it's a time when everyone can relax and enjoy each other's company outside the work environment. 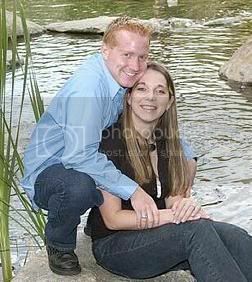 It's also neat to meet coworker's spouses or dates. But the main reason I look forward to our Christmas party is the infamous "White Elephant Gift Exchange". I cannot possibly convey in a post how much fun we have playing this silly little game. First of all, I work with a fun, great group of people. That's the first necessary ingredient. Add in some gag gifts, gifts of an alcoholic nature, girly gifts, tools, toys, etc. and you're gonna have some laughs! The game starts out pretty boring: people opening gifts - everybody saying, "Ooh", "Aah" etc. It starts getting interesting, however, when the first gag gift is opened. Tonight's first gag gift was a Snoop Dogg doll! What made it even funnier is the guy who opened it is a white computer techie who was wearing Wrangler jeans, a cowboy shirt and boots! It was painfully obvious, rap music is not his thing. Anyway, everybody starts hootin' and hollerin' and saying "Ooh!!! !, Alright Michael! WOO HOO!!!" He smiles, takes a bow, and goes back to his seat. Then about ten minutes later, somebody steals it from him! I sure didn't see that coming. I elbowed my husband and said, "Honey, you ought to steal it and give it to your brother for Christmas!" Paul's brother, David, likes rap music and they always give each other gag gifts at Christmas. Well, Paul never got the chance because someone stole Snoop Dogg again and after that, the rap doll was frozen and couldn't be stolen again. Another 'hot' commodity that always gets a lot of laughs is any alcoholic beverage. 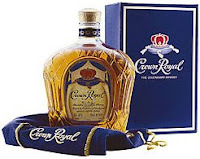 Among the alcoholic gifts were two bottles of Crown Royal, some Bailey's, a bottle of wine, and a bottle of scotch. Every time someone opened up a gift with alcohol in it, they quickly scuffled it back in the bag and tried to get out of sight - hoping others in the room would forget what they have and not steal it from them. It's always a hoot watching people steal other people's presents. It's like the Grinch Who Stole Christmas except there's a whole lot of grinches in the room! Another funny thing that happened, was when this guy opened up his present, and found a SnugSack inside. A SnugSack is a blanket that has arms, so it's like you're wearing your blanket. Anyway, everybody laughed and he sat down. A few minutes later, another guy stole it from him! The funniest part though, was near the end of the gift exchange, when the original guy who had it, stole it back from the other guy! Good times... GOOD TIMES! When my number came up (#25), I chose a large gift bag. When I opened it, I found a really nice faux mink throw. Everybody oooh'd and aaah'd and then I sat down. I knew I'd never make it through the night without it being stolen. When it was Paul's turn (he was #57), he stole a $15 Walmart gift card from one of my coworkers a couple seats over from where we were sitting. It was funny because everything this coworker picked out kept getting stolen from him. As a matter of fact, HE'S the one that stole my faux mink throw! Since my gift was stolen, I had two choices: pick another gift or steal a gift. I opted for the latter and settled upon a cute Snowman mug set. I'm a sucker for anything snowman related. I also lucked out and won a door prize tonight - a $25 American Express gift card! So I racked up pretty good this year. In fact, this makes two years straight that I've gone home with a nice White Elephant gift! 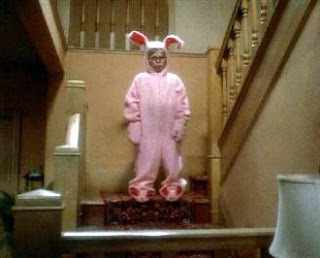 So why do I have a picture of Ralphie in his pink bunny costume? I don't know, I just love A Christmas Story. It's my favorite Christmas movie of all time and that particular scene always cracks me up. Dad to Mom: "He looks like a pink nightmare!" Hee Hee. We watched A Christmas Story last night and enjoyed it as much as the first time we saw it. Ho Ho Ho everybody! Tis the season to be jolly. Have a great weekend! P.S. Today was my sweet husband's birthday. He turned 41 today but heck, who's counting? :) Happy Birthday, Paul! I hope you enjoyed your special day. Liza - It was a blast! Yes, normally a gift can be stolen three times before it's locked but last night the rules were changed to two times so that the game would move along a little faster. Happy birthday to Paul, and the party sounds like it was so much fun. A Christmas Story is my absolute favorite Christmas movie, too. When Santa pushes Ralphie down the chute wih his boot, I crack up every time. wow. Your Xmas parties sound like the best ever! And all the gifts! Sounds like hootin', hollerin' fun! And a Happy Birthday to Paul! We have been going to your office Christmas party now for nine years, and each time has been a hoot! The people you work with are funny and enjoyable to be around, and all of them have a great sense of humor. The White Elephant gift exchange is the highlight of the evening! Most of all, thank you for the birthday wishes. I obviously married up when I married you - and it is the best thing I've ever done. Hey good looking, let's go celebrate my birthday! Woohoo! Da Old Man - I love it when Santa gives Ralphie the boot too! :) HO HO HO!!! Natalie - I can relate. Trust me - I've gotten some bad gifts. One year a real sweet friend of mine opened up her gift and lo and behold it was a bottle of Geritol! Everyone felt so bad for her. But that's the way it goes. I try to look for pretty gift bags that are medium to large-sized (hoping a girl brought it). The girls usually always give nice gifts. Fitness Diva - It was great fun. I was thinking the same thing too re: Paul's birthday! :) He got free food, free entertainment and had lots of laughs. We love "A Christmas Story" too! It's a must watch every year, at least once, but we usually watch it several times and yes, we do own it on DVD! 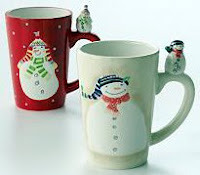 I like the snowman mugs you wound up with, very cute! I'm glad you enjoyed the Christmas party. Sounds like fun! What a great way to relax and have fun at a party. Lynne - We watch A Christmas Story several times a year too! I gave the mug set to my daughter and son-in-law and they love it. Davida - It was a lot of fun! :) Thanks for stopping by! Karen - It's the white elephant gift exchange that makes it so much fun year after year. Sue - We had a blast! :) Thanks for dropping by! The party and gift exchanges sounded like a blast. As for A Christmas Story, aside from the fact that it is a great movie, we always watched it because Ralphie bore a striking resemblance to my younger brother. it does sound all really fun. I am so sorry I am so late in commenting. My connection is slow compared to most. so to stop and leave comments is very difficult sometimes. Happy belated birthday to Paul your hubby. I always drop by his blog too if I can. And last but not least thanks for following me on twitter. And I hate waiting around in a Dr.S office too! Jackie - Thanks for leaving a comment (late or not!) :) We had a lot of fun last Friday night. You're welcome re: the Twitter follow. Thanks for following me too! I spent so much time today messing around with Twitter, I didn't get all my dropping done! Dickster1961 - We had a blast. Ralphie from The Christmas Story is such a cutie - I'm sure your brother is too. Thanks for taking the time to comment! I appreciate it.